Can assist you when there is a possibility of your vehicle colliding with a vehicle or a pedestrian detected in front of yours. 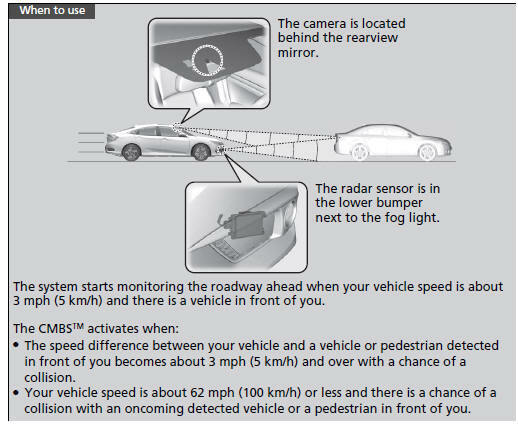 The CMBSTM is designed to alert you when a potential collision is determined, as well as to reduce your vehicle speed to help minimize collision severity when a collision is deemed unavoidable. Important Safety Reminder The CMBSTM is designed to reduce the severity of an unavoidable collision. It does not prevent collision nor stop the vehicle automatically. It is still your responsibility to operate the brake pedal and steering wheel appropriately according to the driving conditions. You can read about handling information for the camera equipped with this system. Be careful not to have the radar sensor cover strongly impacted. Rapid vibrations on the steering wheel alert you when your vehicle speed is between 19 and 62 mph (30 and 100 km/h) with an oncoming vehicle detected in front of you. 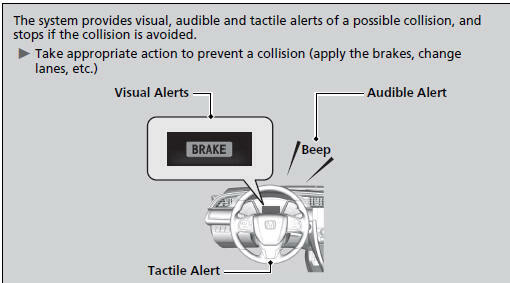 When the CMBSTM activates, it may automatically apply the brake. It will be canceled when your vehicle stops or a potential collision is not determined. At system's earliest collision alert stage, you can change the distance (Long/ Normal/Short) between vehicles at which alerts will come on through driver information interface*/audio/information screen* setting options. The camera in the CMBSTM is also designed to detect pedestrians. However, this pedestrian detection feature may not activate or may not detect a pedestrian in front of your vehicle under certain conditions. Refer to the ones indicating the pedestrian detection limitations from the list. When a potential collision to an oncoming detected vehicle is determined, the system alerts you with rapid vibration on the steering wheel, in addition to visual and audible alerts. ► Take appropriate action to prevent a collision (apply the brakes, operate the steering wheel, etc.). Vibration alert function is disabled when the electric power steering (EPS) system indicator comes on.